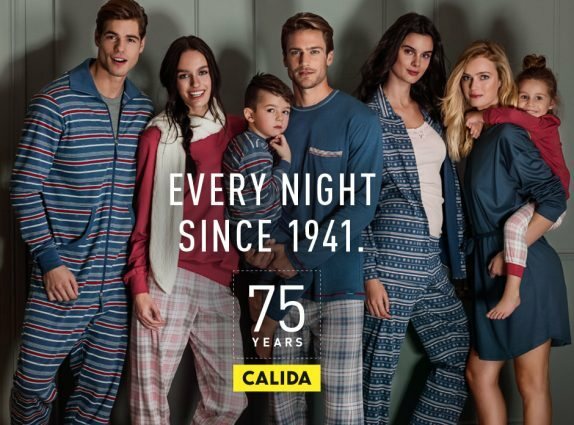 The first time you put on a garment by the Swiss brand Calida, best known for pajamas and bodywear, you’ll become a fan for life. When I recently unwrapped my latest Calida goodie, I was doubly delighted to see a 75th anniversary hang-tag. Calida’s online campaign is full of European style, as befits a global brand that operates in 20 countries. The homepage offers an anniversary contest: 1st prize a week at a Swiss ski resort, 2nd prize jewelry, 3rd prize Calida products. The timeline embeds funny old videos and classic graphics (the English translation, a bit ragged, needs editing). The tagline “Every Night Since 1941” is light-hearted and accurate. All in all, the anniversary campaign endeared me further to a brand I already love.